The most exciting self-publishing promotion of the year gives back $300 to authors to begin publishing a book with either the Diamond or Pearl book publishing services from Outskirts Press in September. Outskirts Press, the fastest-growing full-service self-publishing and book marketing company, announces the return of “Mad Money.” During the month, authors can get an extra hand in fulfilling their dreams to publish a book with the return of the company’s popular “Mad Money” promotion. Authors who purchase the Diamond or full-color Pearl book publishing packages in September with the promotion code: MADMONEYSEPT15 are rewarded with a credit of $300 applied to their Outskirts Press shopping cart accounts. The $300 “mad money” credit can be applied toward any production or marketing option offered by Outskirts Press, including custom cover design, professional copyediting, cover scribing, an Amazon Kindle edition, or many others. 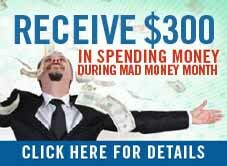 For more information about Mad Money Month, click here to receive $300 in publishing money. Thank goodness for my Mad Money. Just wish it had been $1000.00 so I could have this great publisher do more with my “first” book. If you’re new to the game of writing, stop searching for publishers. Just contact Outskirts!